MALAYSIA in central Pacific Asia has a population of about 25 millions people (03/2007) and stretches on 330,000 km. 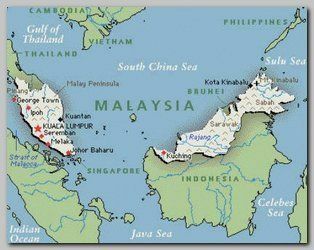 Half of the country is in the Southern ridge of Malay peninsula and half on the Northern coast of Borneo Island where MaLaysia shares a long jungle border with Indonesia. About 52% are Malays, 30% from Chinese descent and the rest from a large variety of ethnic groups. About 60% are Muslims, 20% Buddhists, 10% Christians and the rest practice Hinduism and, so called, traditional beliefs. Officially MaLaysia is a federal constitutional elective monarchy but, in fact, it is more of an Islamic technocracy and a limited democracy. MaLaysia is a unique example of an Islamic country without huge oil reserves and with a limited democracy that has a booming fast growing economy. No wonder that the country has strong self confidence and does not need to blame others for her failures. Therefore the Islam in MaLaysia, that always practiced a moderate version of Islam, is not a frustrated Islam like in Islamic poor nations. In MaLaysia the authority has a grip in all aspects of every day life and controls, in a very efficient way, the regular civilian life. MaLaysia s’ authority have the tools and are responding very fast against any extreme Islamic organization to their point of view.